What do you get when you combine a happening ChurpOut event with a Nuffnang Bloggers Sharing Session? Have it at the new Chatime Publika in Solaris Hartamas, and you have a very big group of awesome bloggers all out to have good fun over some drinks and games! That was exactly what transpired this afternoon at Chatime Publika, where ChurpChurp and Nuffnang held a "TeaTime with ChaTime" event inviting blogger and twitter fans to just spend an afternoon chilling out. So there we were all gathered in Publika Eat Food Village, before being given RM20 Publika cash voucher to spend on anything in the food village. Needless to say, our first choice was Chatime! I have never tried Chatime before, and was really excited to have my first taste. Being given RM20 to splurge on Chatime was indeed very cool. After consulting a fellow blogger, I chose my first Chatime drink to be the Japanese Matcha Tea Latte and promptly ordered it. Chatime's Japanese Matcha Tea Latte - RM6.90 with "pearls"
"All work and no play makes Jack and Jane a rather dull person". In this case I rather rephrase it to "All blog and no play makes you and me a no-lifer" hence the Nuffies and Churpies had some games all lined up for us, with rather attractive prizes. All we had to do was to form a group of 4 persons, and play a "guess the Chatime drink" game. Eight cups of Chatime drinks were laid out on the table, and each of us got to test 2 drinks. We had to guess the name of the Chatime drink after the quick taste. For a first timer like myself, I found it rather confusing, but managed to get 2 of my drink's name correct! And the winning team goes to... The Incredibles! We were pleasantly surprised when the results came up 5/8 drinks correctly guessed by my team, and each of us got to walk away with a ChurpChurp plushie, a Nuffnang T-Shirt, and coupons from Chatime Publika each. It was a pretty good feeling to win something. Do check out below on some of the photos I managed to capture of the event today. Merryn and her family, picture perfect. Overall, it was a successful event, bringing together familiar and new faces of Nuffnang and ChurpChurp where everyone were friendly to each other. New friendship were forged, and existing friendships strengthened. 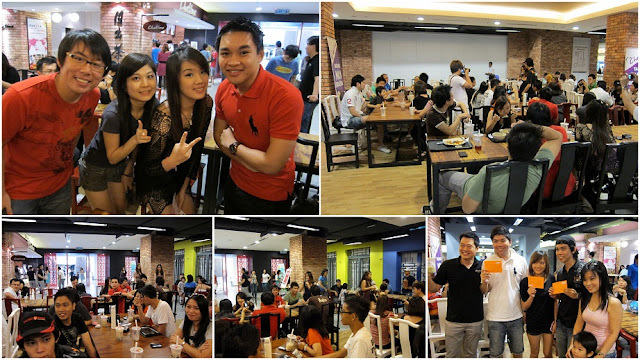 Thank you Nuffnang, ChurpChurp and Chatime Publika for holding this event for your fans and followers. Looking forward to more gatherings like these. "Teatime With Chatime", the perfect afternoon. wow u are so quick! efficient blogger! yea man. Nice catching up with friends and meeting new friends! So you had a blast! I never attended any events, guess I am shy! so nice to have the time to attend those awesome events. wahh...so nice.. i think i better migrate to KL la!! Oh! First time drinking Chatime? That's surprising cos I thought you always go to every possible places LOL!! Anyway, I'm not a fan - prefer Snowflake! Haha!! Btw, how come this post's URL link is unclickable in my Blog Roll?? Yep, Had a blast! :P and i don't think you are shy la bro. Come join us for some makan makan session sometime. lol!! on a high now from the sugary Chatime? Nice meeting you again! wow! good gathering to know all of the awesome bloggers! Great Churpout!! ^u^ Happy Day!! wah tis one u super speed ar? Hehe so happening! So many bloggers turned up. wow, that's really a big bloggers event huh?? how come i wasn't invited?? hahaha, just kidding.. oooh, guessing the name of the drinks?? that's tough but yet your team made it, cool!! It was ur first time drinking chatime, so cute oneeee! I want the plushie please please pleaseeeeeee!!!!!!!!!!!! So nice! U got a cutie churp churp plushie! the beer shirt stood out!